In May of 2011, leaders of six healthcare professions and the US Health Resources Services Administration (HRSA) convened an event at the National Press Club. They announced a historic collaboration to seed a new course for clinical medicine. They represented conventional medicine, osteopathy, nursing, public health, dentistry and pharmacy. Each committed to jointly addressing the gaping, harm-strewn chasms of disrespect separating healthcare professions. As a first offering, they rolled out a set of competencies to kick-start an era of interprofessionalism in practice. One after the other, leaders of these professions’ academic councils – “guilds” may better capture the self-interested tendencies of each – bore witness to the need break with the past. They announced their new Interprofessional Education Collaborative (IPEC) to guide the competencies to life. A long shadow hung over the event. Forty years earlier, a 1972 Institute of Medicine (IOM) report had recommended a similar transformation to team care. The intervening To Err is Human report from the IOM in 1999 put a human price-tag on the failure of these professions to build respectful teams against the silo-building inertia of volume-oriented medicine. That report’s gloomy game-changer for public trust in medicine estimated over 100,000 medical deaths due to customarily-practiced medicine – a shocker that has been put closer to 250,000 since. Poor communication and a context of disrespectful and what has since been called medical bullying were identified as major contributors. Failure to act on the 1972 report put blood on everyone’s hands. Batting clean-up in the testimonials was a diminutive, impassioned, ex-professor from Harvard Medical School, George Thibault, MD. Thibault had been recruited to lead the Josiah Macy Jr. Foundation 3 years earlier. The Foundation is the only philanthropic organization devoted solely to health professional education. Macy’s money, under Thibault’s direction, had invited the leaders of these academic organizations into the workshops to collaboratively create the competencies. If anyone at the National Press Club that day doubted that Thibault would allow these competencies to suffer the fate of the 1972 recommendations, he soon laid them to rest. Never again was Thibault’s essential declaration, or at least not on my watch. Interprofessional Education Collaborative (2011) The big six professions (MD, DO, DDS, nursing, public health, pharma) noted above are core, but these have since opened their doors to others to offer multiple education and training programs. National Center for Interprofessional Practice and Education (2012) This federal government-foundation joint venture housed at U Minnesota put the first $13-million together in an effort to produce an overarching guiding initiative. Global Forum on Innovation in Health Professional Education (2012) Eighteen health professions are members of this National Academic of Medicine initiative that is, through 13 workshops and reports, the most significant, global, ongoing commitment of health professions to work collaboratively. Advancing the Evidence Base The whole system nature of the shift toward team care has made the development of evidence to support the common sense in this change a challenge. Thibault targeted Macy funds to create research exemplars, some of which were featured in this workshop summary. One way that professional silos and related academic prejudice diminish potential contributions from professions like chiropractic, naturopathic medicine, acupuncture and Oriental medicine, massage therapy and direct-entry midwifery is by not deeming their academic initiatives worthy of foundation or governmental support. Members of these professions can’t get their hands on funding for self-betterment projects. In 2013, with the first of two presidential grants totaling $65,000, Thibault quietly broke that glass ceiling that separated Macy and other major US foundations from funding of CAM or any other significant integrative health project. Thibault made the grants to what is now the Academic Collaborative for Integrative Health (“the Collaborative”). The funded project, directed by the Collaborative’s Deborah Hill, MS, involved a collaboration with six recipients of NIH National Center for Complementary and Integrative Health “reverse R-25″ education grants. Increased proficiency related to scientific evidence was proposed by ACIH and accepted by Thibault as a key to greater interprofessional engagement for members of these professions who were emerging as parts of the healthcare’s new team-scape.The initiative created a unified set of data and resources to assist members of the so-called “CAM” professions to advance their evidence-informed education and practice. 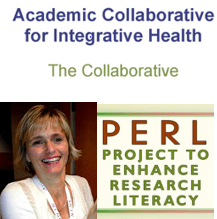 The initiative, with which I had a chance to be involved, is called the Project to Enhance Research Literacy (PERL). The resources are openly available. The funding Thibault extended led in the second year to creation of a resource guide entitled “Achieving Competency in Evidence Informed Practice” (EIP). The key audience is academics in the roughly 180 programs in chiropractic, acupuncture, naturopathic medicine, massage therapy and direct-entry midwifery with US Department of Education recognition, all delivering education focused on non-pharmacologic approaches. The 2011 event at the National Press Club amounted to a public display of fealty to the idea of a more respectful era of interprofessionalism and team care. Thibault’s vision and action against a prevailing, exclusionary elitism are timely door-openings as integrative practitioners are increasingly viewed as part of the answer to the nation’s crisis of chronic pain care. Credit Thibault for opening doors. Now, in the coming post-Thibault era of team-care, it’s time to extend his legacy and pop those doors open further. Clinicians who don’t look first to drug solutions need to be part of the circle of care in pain treatment and for any other chronic condition, for that matter.